the energy of play... in the world of work. Capture what is hard to put into words. It’s a great vehicle for helping employees open up so they can discuss change, conflict or other emotionally-rich topics. 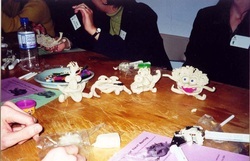 Easy access to oogly clay can be a great way for individuals or teams to let off steam, channel anxiety, move beyond blocks or just get the creative juices flowing. Among team members, oogly offers a quick and cheerful medium for sending appreciation for work well done. The special non-drying oogly clay can be used over and over again, never needs water and doesn’t make a mess. Available in Individual kits with instructions or the 4-user Group Kit with the oogly Handbook.